Pumpkin Pie may be the most popular pumpkin dessert, but the pumpkin's mild and sweet earthy flavor, make it ideal in so many other desserts. Take these Pumpkin Scones. Like a Pumpkin Pie they combine the flavor of pumpkin with its complementary spices (ground cinnamon and ginger). Buttermilk is used to bind all the dry ingredients together which gives the scones a bread-like texture and also helps to offset the dense texture of the pumpkin. These scones are baked at a higher than normal oven temperature which gives them a wonderfully crisp outside crust. Buttermilk has a thick creamy texture with a rich and tangy buttery taste that makes baked goods tender. It is commercially made by adding a bacteria to whole, skim, or low fat milk. However, you can make a good substitute for commercial buttermilk. Add 1/2 tablespoon of white distilled vinegar, cider vinegar, or lemon juice to 1/2 cup (120 ml/grams) of milk. Let stand at room temperature about 10 minutes before using. Just a side note. Have you ever wondered why sometimes your scone dough is too sticky or maybe too dry? The cause of this is probably your flour. Flour absorbs different amounts of liquid depending on the weather (how humid) or its freshness. So when adding the buttermilk, start with 1/3 cup (80 ml/grams) and mix the dough. And then, if needed, add more buttermilk. 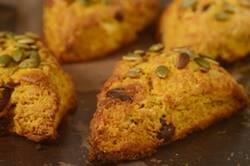 Finally, you can use either homemade or store bought pumpkin puree in these scones. Just make sure you do not buy the pumpkin puree which has the spices added to it. To make your own puree, use the smaller pumpkin varieties like Sugar Pie, Baby Bear or Cheese Pumpkin (approximately 5-7 lbs., 2 1/2 - 3 1/2 kg.). To begin, first cut the pumpkin in half lengthwise, remove all the seeds and stringy fibers, and then place cut-side down on a greased baking sheet. Bake at 350 degrees F (180 degrees C) for approximately 45 minutes to 1 1/4 hours (depending on size) or until easily pierced with a knife. Let cool, then scoop out the pulp and puree in your food processor until smooth. You do need to extract all the liquid, so strain the pumpkin through a cheesecloth lined strainer and then cool the puree before using.